Last April I wrote an article where I introduced a strict validation method for machine-designed trading algos. 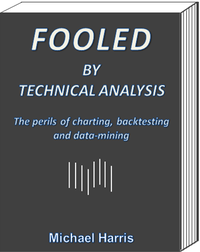 This article includes the forward performance of the trading algo in that article, as well as, of another algo that was machine-designed in April 2013. In a nutshell, there are two types of trading algos: human-designed (analysis) and machine-designed (synthesis). I have talked about those two different types of trading algos in my books and trading journal articles in the last 16 years. The main problem of both methods is data-mining bias. In my new book I talk about these two methods in detail, I identify the bias at each stage of the process and I offer practical ways of minimizing it. One of the reasons for presenting the forward performance of the machine-designed trading algo in this article is that I was recently contacted by someone who claimed that he has developed a program that identifies price patterns. He also argued that based on his findings the price patterns did not perform well in out-of-sample testing and since the patterns identified by Price Action Lab seem to perform better, then this means among other things that I did not provided enough information so that he could reproduce the results. I will start with the last statement about not providing enough information for reproducing the results. Even if I provided more information, reproducibility is unlikely. For example, there is this website that aggregates quant articles from which I withdrew recently for reasons discussed in other articles. I have been unable to reproduce any results from any of the papers in that website, even of the simplest systems, while I have found wide variations and even basic errors. Given that Price Action Lab software is quite complex, reproducibility is almost impossible. Then, this is the highly competitive trading business. Most people are happy that someone provides even a general framework for dealing with a serious problem, such as validation for example, even if the results are not exactly reproducible. Specifically, the goal in the mentioned article was to introduce a strict validation method. This is a blog about trading and not physics research that requires reproducibility for being published in a peer-reviewed journal. Lastly, not all price patterns are the same. The quality of price patterns depends on the process used to identify them. General statements about price patterns cannot be made by analyzing a group that was identified via a specific process. That would be like declaring that all swans are white because someone following a specific methodology failed to discover a black swan. In the article I wrote last April I used a price predictor consisting of up to 9 closing prices to machine-design an algo for trading SPY in the daily data timeframe. The details of the machine design process can be found in that article. Therefore, the machine-designed system based on the 9-day closing price predictor that was designed by Price Action Lab outperforms so far buy and hold in forward trading by a wide margin. Since the forward sample in the SPY trading algo example is relatively short, below are the forward performance results from a trading algo for DIA that was developed by Price Action Lab in April 2013 with in-sample data from 01/28/1998 to 12/31/2009 and described in this article. The DIA trading algo shows solid performance in the out-of-sample and forward sample. The Sharpe ratio is 1.38 and the corresponding t-statistic is in the order of 3.38, indicating a highly significant result.